The more we learn about lamb, the better we feel about choosing it for dinner over other meats. Not only does it taste amazing when properly prepared, but lamb is lean, the leanest parts being the loin, leg, and shank. It provides nutrients such as protein, iron, Vitamin B12, and riboflavin, just to name a few. 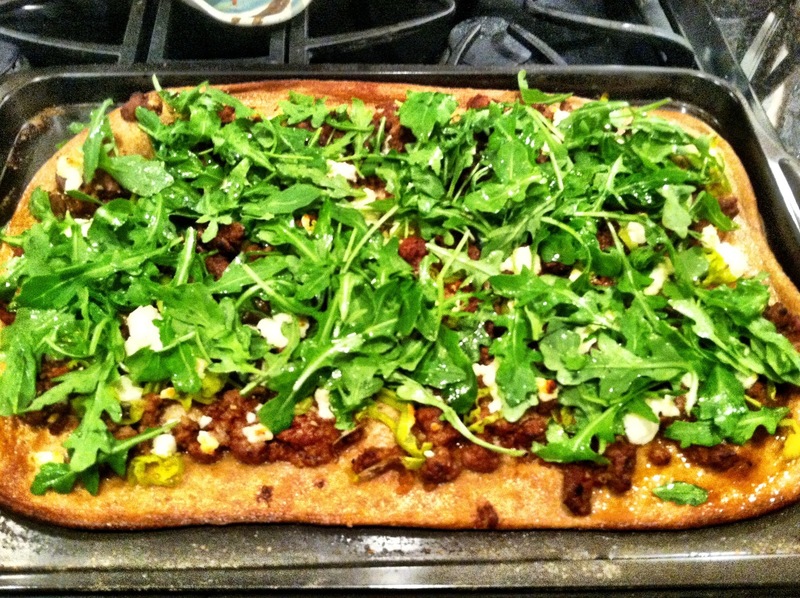 Lamb comes in many forms, and for the first time we used ground lamb during our supper club. It was similar to cooking any ground meat, easily and quickly sauteed on the stovetop. The entire meal came together in under 25 minutes, from the chopping of ingredients to slicing and serving. The result: a "fresh" tasting pizza with a thin and crispy crust. I use the word "fresh" mostly because it was similar to a salad on top of a crunchy flatbread. 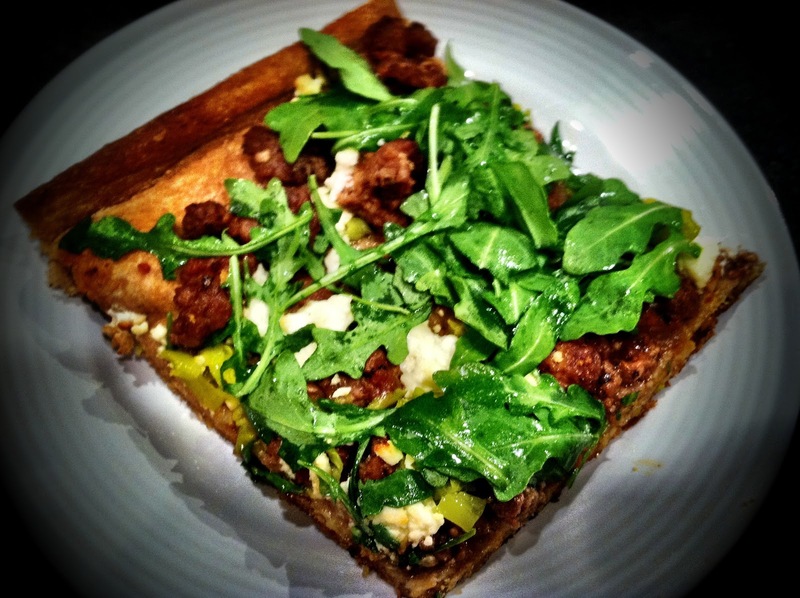 We really enjoyed the combination of hearty lamb, hot pepperoncini, complimented by creamy goat cheese and peppery arugula. It was nice departure from our typical saucy and cheesy pizza (although amazing in it's own right). Pizza is a group-friendly meal because not only do many people like pizza, but also because it requires minimal effort per serving. For us, it's a go-to menu item for last minute guests or a lazy weeknight and we are happy to have a unique version to add to the rotation. Heat oven to 450 degrees F. Brush a cookie sheet with olive oil. On a separate floured surface, roll out your dough and transfer to the cookie sheet. Bake for 5 minutes, remove from the oven and set aside. This “pre-bake” makes a nice crisp crust. Prepare your lamb mixture - Heat olive oil over the stove top in a pan on medium-high heat. Add lamb, shallot, garlic, tomato paste, and oregano. Break up the lamb as you would with beef when making tacos. Mix all ingredients and cook until the lamb meat is well-done. Season with salt and pepper to taste. Drain extra juice from the pan. Spread lamb mixture evenly on the pizza dough. Sprinkle with crumbled goat cheese and pepperoncini. Bake in the oven for 15 minutes. Mix arugula with a drizzle of olive oil. Remove pizza from oven after 15 minutes, or when the cheese is mostly melted and generously garnish with arugula. Check out LeanOnLamb.com for more information on the health benefits of lamb.